The epic story of Group Captain Sir Douglas Bader. A colourful & often controversial character, a leader of Churchill’s Few in the Battle of Britain and later, a German prisoner-of-war in the famous Colditz Castle. 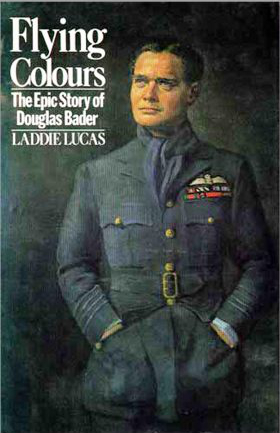 Authorised by Bader, supplemented by private papers, logbooks, personal notes and photographs, author Wing Commander Laddie Lucas, himself a distinguished WWII fighter pilot, reviews the life of one of England’s greatest heroes in this best-selling book. This RARE 1st edition is a mint condition book, absolutely pristine. The best condition example we've seen for many years. Mounted inside on the front end page is an original Military Library bookplate, produced in 1981, for use with this title. This edition is in overall very good condition, showing only the usual minor signs of basic shelf wear expected with a book now over 35 years old. No rips or tears to either jacket cover or inner pages. It is also a rare opportunity to acquire one of these editions where both Bader and Lucas have both personally signed directly onto the main title page without adding any dedication. Not only are these editions very hard to find these days in such good condition, but added to that are the original signatures of both the author and subject. This is an incredible opportunity to acquire a truly historical & collectable item.